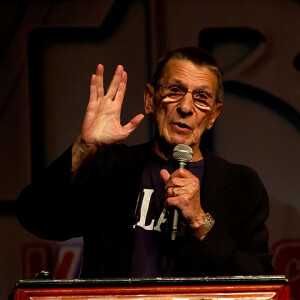 Leonard Nimoy at the Las Vegas Star Trek Convention 2011. Photo by Beth Madison, via Wikimedia Commons. I haven’t blogged on the usual themes in a while, but I didn’t want to save this one for Monday. With lots of tributes going around the Internet on the day of his death, I just watched a video of Leonard Nimoy in which he explains where the Vulcan hand salute came from. Here is the video. Growing up, I watched a lot of TV shows that I don’t remember. I remember which shows, but none of the episode content. One that stands out is Star Trek which I used to watch with my dad. I had to watch the whole series as an adult to remember any of the episodes, but I know I watched them as a kid. And then came college, when Star Trek: The Next Generation came out. Well, it actually started when I was 14, but I didn’t watch it until college. At the time, it was playing on several stations, several times per day. While flipping channels, I saw something just before a commercial break and I had to know what happened next. I was immediately hooked. It turns out, however, that we must have watched the pilot, at the very least. As the series finale approached, I had to rent the pilot to be sure I had seen it, as I knew they were closely related. And I remembered that the station was actually an alien, so I had obviously seen it before. Back in those days, there were lots of smaller Star Trek conventions. A few ran in South Florida and for a few years, I went to all of them that were within a few hours’ driving distance. At the time, I had a Star Trek themed bumper sticker. I remember it was green and said “My Other Vehicle is a Federation Starship”. I was driving south to Fort Lauderdale for one of the conventions and I noticed another car on the highway with a Star Trek bumper sticker. I passed the car, the car passed me, back and forth a couple of times. We both pulled off at the same exit, as I expected, and pulled up next to each other at the traffic light. We looked at each other and I smiled and waved. The guy in the other car waved with a Vulcan salute. Whoops. I quickly changed finger position before the light turned green. One of my favorite tweets today has a genealogy twist to it. Thank you Leonard Nimoy for the memories. Live Long and Prosper. Very sweet tribute, Banai. I too grew up on original Star Trek, mostly because of my father. I remember sitting in the movie theater with my mother, watching Spock die in Star Trek II: The Wrath of Khan, both of us sobbing. To this day, I cry every time I see that scene. It will be worse now, I’m sure.